Before receiving her MA New Media at the University of Amsterdam in 2007, Paulien Dresscher gained her BA Video Art and Media at the Minerva Academy in Groningen in 1994. Since then she is working as an independent artist, editor and filmmaker and is teaching at the Willem de Kooning Academy in Rotterdam. 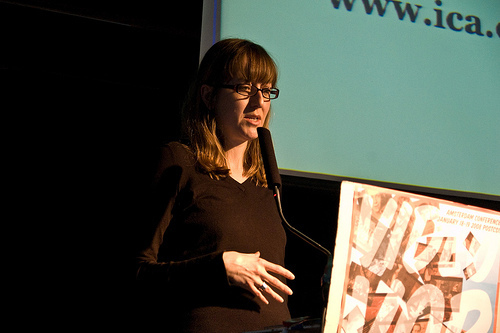 Since 2009 she is E-Culture adviser of the filmfund.nl. Currently she is enrolled at UvA's international research master Media Studies program. Paulien Dresscher is living with her husband and daughter on a sailing ship in the center of Amsterdam. 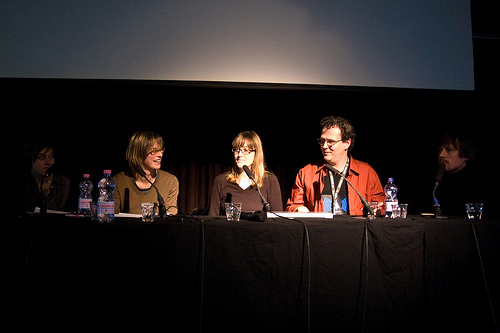 This part of the conference is dealing with curating online video and was moderated by Vera Tollmann. The main question was why filmmakers and artists working with moving images don’t occupy Youtube as the perfect way to archive and distribute their work and to reach larger audiences. Bands and musicians inhabit Myspace, but why don’t use artists the online databases as a perfect place for their portfolios? And if artists were going to do so, what would happen with the curator? Would there be something left to do for him? The first speaker on the subject is Sarah Cook. 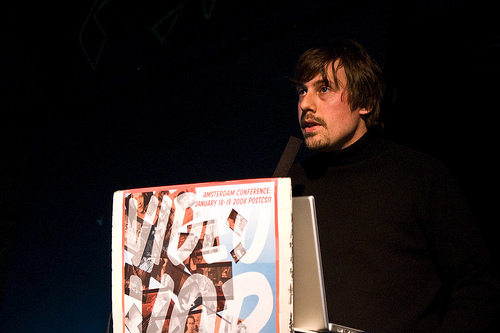 Cook is a curator of contemporary art and co-founder, editor and researcher of Crumb, an online resource for people involved in the exhibition of new media art. First she is looking at the early history of how artists are dealing with the concept of broadcasting. She mentions that in the 60-ies, artists do first look at television in an architectural way and use it as a sculpture. Later they tried to intervene with the broadcasting process of regular broadcasters and made anti-art. Cook showed many examples of these early broadcast interventions. One of the early reality-TV program we see is the “An American Family” and was produced by Susan Raymond and Alan Raymond. In one episode of the series, made in 1972, the family did visit the Whitney Museum’s Warhol show. Cook showed this clip (which can be found on Youtube) as a comment on how TV documents art. Marisa Olson’s video piece ‘The One that Got Away’ is a re-enactment of her audition for American Idol as she was unable to use, for copyright and legal reasons, the actual footage of the audition from the TV show. Here art is documenting TV. Another way of intervention was done by Anna Ridly with her Annalogue productions for channel 4. Here the artists invited were the ones who called the shots concerning length of the program, time of broadcast and content. A project like this is nowadays unthinkable with the strict time slots and theme channeled television structure. You look at the web as the new TV, aesthetically speaking. It gives freedom for the artist on content, programming time and broadcast schedules. There is gap though, between artists working on TV and on the web. Mentioned is the work of Miranda July as the one who made the first video-chain letter by sending and resending videotapes as an early example of file-sharing. All these examples are about artists seeking another platform than the museum. What is an artist on the web nowadays? According to Cook for most artists any medium will do. I understand this as whatever medium the artists will encounters, they will find a way to reflect on it to make it their own, disregarded its nature. Concerning to Youtube, I think this still just did not fully happen yet. This time in transition between the television and the web, artists are creating their own way of distributing their work and creating different types of viewers: artists, webviewers and TV viewers. The question is what happens to the role of the producer/distributor. While in the old days a curator just was curating, now they are more a future filter feeder. The role of the audience changes as well. They become creators. The Star and Shadow Cinema in Newcastle is mentioned. This non-profit organization shows all kind of independent films, which are, send in by the audience themselves. Someone in the audience mentioned the Smart Project Space located in Amsterdam as a similar project. Here you can get a key at the desk if you want to watch a film by yourself. The second speaker is Thomas Thiel. He studied Cultural Sciences and Aesthetical Practice in Germany and France and has organized several independent art projects, exhibitions and lecture-series concerning contemporary art and new media. Since 2004 he is curator for the ZKM: Center for Art and Media Karlsruhe. What is Youtube exactly and what can it is about? 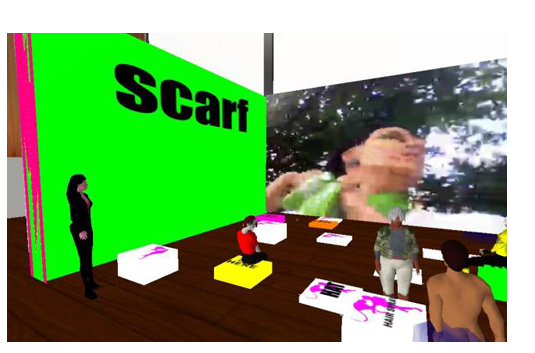 What will be the future of videoart and what will be its financial and distributions models? Will supply increase on demand, do we want to view videoart at home? What to do with copyright? The reason artists do not want to occupy Youtube is because they don’t want to be online. They are worried to loose exclusivity by being too available, the quality of image is too low and they are not sure how to do with matters as copyrights and Individual Property. Besides this, they are missing control and context. That what they make, is not meant to be on the Internet and many works are on multiple channels. Besides this, Youtube for example does not have much space for further portfolio or other references. If they use online storage, they rather use their own password protected website. I wonder though, if this isn’t also just a matter of time. The new generation artists, growing op with Myspace profiles and SMS accounts, may be less concerned about the downsides of online availability. What is Youtube now exactly about? According to Thomas Thiel, Youtube is more about art than being art. It is about marketing and gossip, exhibition walkthroughs, video documentations and interviews. Youtube is a resource for the arts, in terms of content (non-artistic documentary’s), in terms of aesthetics (webcams, home video’s) and in terms of techniques. Curating network-based video is interesting in the context of research for web 2.0 and education. It is easy to access by using search filters, indexes, metadata, categories and tags. Besides this, it combines sources as video, image and text. The question is if museums are going to functions as distributors and broadcasters. Thomas Thiel recently co-crated the media art exhibition Mindframes, a Media Study at Buffalo1973-1990 with Woody Vasulka and Peter Wiebel where they made a case study of this. Mindframes exists of 120 hours of video and researches ways how to make this accessible by use of touchscreens and dynamic content management systems. 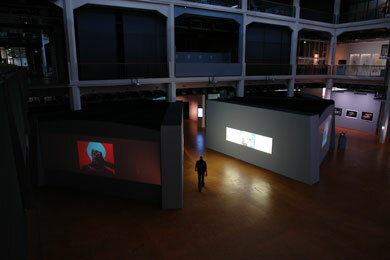 It is a new orientation in history and preservation of media art. Thomas Thiel ends with the remark that despite all the multiple displays and screens we need to keep concentrated while extending the possibilities of multi-viewing. Since everyone nowadays can easily make something for public consumption and show it on the web, what does this mean for curators of media arts? The DIY aesthetics can be witnessed across associated digital-based arts (music, photography and film) and it enables artists to get in touch with their audience immediately. Emma Quinn did her MA in Digital Arts and is working at different art groups as Spore and Soda. 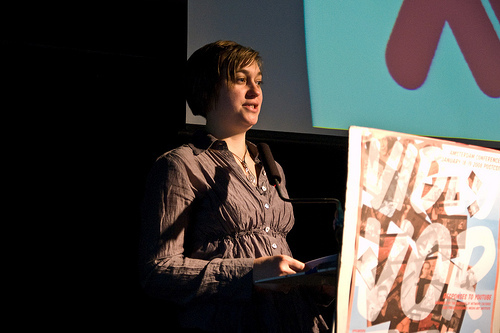 She joined ICA in 2005 and is director of Live and Media Arts where she curated live installations as Flock (February 2007) and Theo Janssen’s Strandbeesten (June 2006). Her talk concerns mainly her work for the ICA. They are in a state of flux and are trying to expand the media art to live media art and mediated creativity online. Technologies change overtime and are changing the cultural. We move from emails, to digitized photography and technology is becoming less marginalized over time. Lower costs and easier production allows for amateurs also to create and broadcast. In 1997 the ICA opened a media lab. Here there were classed held, one could play with interactive pieces and checking email. Now the ICA has a online gallery, www.tanktv. especially for screen based media. They were trying to help the artists with their career. They are trying to repurpose the media studio in discussions with artists to see what their needs are. This is ongoing for a year now; time and money are the issue here. Though videos on Youtube where easy to find, while they were normally only distributed via DVD, but the people who uploaded it had no clue what the movie is about. Within physical gallery, there are not much viewers but it can help artists on exhibition. Screen-based work is now distributed via network more vastly. The question is what to do with the physical space? And, online, cannot artists do it themselves and better? Youtube is huge and there are all sorts of IP and copyright matters. Emma Quinn wants to support the artists and create work that is interesting or challenging. From that perspective the ICA wants to build up a body of work to show, to maintain and to archive. Anyone can make a funny picture in Photoshop. But Media Art is teambased and you need more depth, time, money and skill to make it. 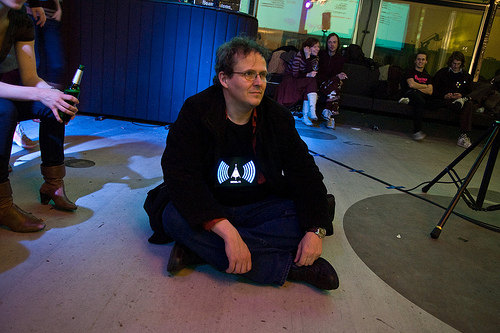 Patrick Lichty is an editor, curator, writer, musician, engineer, and conceptual intermedia-artist working in activist art, retrotech, digital minimalism, alpha revisionism, and experimental video among others. In this presentation he addresses the cultural landscape of online video. He is going to show some models and ideas, but remarks, that these are not the only ones there are. Recently, video is re-emerging as the hegemonic media and is dominant in the technological art. The question is, what are the reasons why artists are not widely embracing sites like Youtube, Google Video and Blip TV as their primary form of distribution. In David Antin’s essay Video: The Distinctive Features of the Medium about the differences between video and television he describes how television is the purview of centralized corporate networks, enforcing top-down distribution practices. On the other hand, video is a bottom-up enterprise, creating grass-root social networks of practitioners, evidenced by artists like TVTV, Paper Tiger and Dan Sandin, who offered early ‘open source’ plans for video synthesizers. Antin later admitted that the equipment was still too expensive for wide spread attention. Access is dependent on hegemonic technologies and codecs. There are so many different standards like Flash, QuickTime, VHS, DVD, Blue Ray etc. Some of those are going to survive and the visibility of the work is depending on this. Also the screens we are watching on keep changing. It moves from 36mm to Flash and QuickTime. 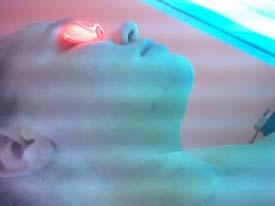 How does this shape the way we connect to the material? We could even say that video online is about socio-cultural context. In the age of Youtube, cheap digital video production devices have realized Antin’s vision and perhaps further. Grass-root video has created seas of moving images in the online realm. The disparities between Antin’s definitions of broadcast and video have flattened but the top/bottom dichotomy still exists. into Second Life itself. While efficient, each release requires an edit, submission to each online venue, hosting, and promotion to key bloggers and the group’s blog as well. Experts and expertise are needed within a cultural context. In The Long Tail, WIRED editor-in-chief Chris Anderson proposes the creation of culture that is empowered through cheap digital media tools to create nearly infinite online marketplaces of inexpensive media product. Conversely, Andrew Keen writes that this profusion of media creates the technocratic conflation of facility and talent: expertise is devaluated. A lot of new media artists are now academics or established otherwise. There is a ‘war’ going on between the traditional cultural agenda and the open culture. For example you are loosing IP easily at Youtube and even the second life’s user agreement states that you lose IP. Now with video being the new object, it is more important to look at the frame rather than the content. This creation of many forms on many platforms for mass distribution through massive cross-linking is certainly a realization of the Deleuzian rhizome. However, the reality of the online art distribution model is more “lumpy” or weighted than more the uniformly flat rhizome. The artist will be aware of his audiences, and focus on the platforms and methods necessary as context for that particular body of work. The accessibility of digital video production has all but fulfilled Antin’s vision of a mass grass-root video culture, but the collapse of the high/low cultural binary. 2.0 did not destroy, but created new forms and ways of distributing and producing. There are a lot of models on this. Curating will be matching context and content to the right audience. There is a mass culture that has created a sea of online video, so undifferentiated and diverse that the only assurance that art video might be found at all is through meta-tagging and cross-linking through blogs and social media sites. Video is the new media again for communication from high to mass culture and the artist is the one with the camera. After this there was a short panel discussion about the role of the curator. Patrick Lichty stated that he thought the role of the curator in the future was to be taken part of the dialogue about certain aspects of culture. Sarah Cook sees this future model as making things more popular and she sees room for curators for different sort of niches. Hierarchies are changing and curators have to respond to those things. From the audience comes the remark that curators were the middle person between the artist and his audience. This position is threatened due to 2.0. Maybe it’s a solution to look at the curators’ role to help to rate and analyze the work. This would make a shift instead of being an audience seeker he would become an intellectual. Thanks for the great report on the panel. Two clarifications regarding my presentation, which aimed to explain the thinking behind the upcoming exhibition ‘Broadcast Yourself’ – co-curated by myself and Kathy Rae Huffman for the Hatton Gallery as part of the AV Festival 08 in Newcastle/Gateshead (http://www.avfest.co.uk) and Cornerhouse. The first reality TV project I mentioned is called ‘An American Family’ and was produced by Susan Raymond and Alan Raymond. In one episode of the series, made in 1972, the family did visit the Whitney Museum’s Warhol show, and I showed this clip (which can be found on YouTube) as a comment on how TV documents art. Marisa Olson’s video piece ‘The One that Got Away’ is a re-enactment of her audition for American Idol as she was unable to use, for copyright and legal reasons, the actual footage of the audition from the TV show. Here art is documenting TV! I welcome other comments and feedback on our panel!